When you envision living with your significant other, everyone pictures the perfect scenario. You may imagine mornings sipping coffee together, afternoons re-decorating your home or evenings spent killing zombies on the Xbox. The idea of seeing the same person’s face every morning when you wake up and every night before you go to sleep fills you with contentment and joy. Moving in together signifies a step in the relationship when most couples discuss the future and what it holds for them. This is also when many couples decide to move toward their bright, beautiful future by combining their households into one and moving in together. Whether moving from one party’s home into the other’s or even relocating to someplace brand new for both of you, this will be one of the most exciting transitions of your lives. Moving in together is often rife with excitement as well as a good dose of apprehension. When combining two separate homes and uniting two independent people under one roof, there is potential for stress. Luckily, there are some great ways to make the transition from separate households to one go as smoothly as possible. From getting rid of all the unnecessary clutter to seeking help from local moving services, here are some crucial tips and advice to help prevent the loving act of moving in together from morphing into a stressful experience. The very first thing that should be mutually settled once you decide you’re ready to move in together is where you are going to live. Determining whether to move from one house to the other or selecting a new home together should be of primary concern. Listening to one another and doing your best to find somewhere you can both live happily is extremely important. Once you finalize your plans, but before the actual move, you and your partner need to create lists of what home looks and feels like for you. Write down when you like to wake up and go to sleep, whether you love to have people over and how often, whether you have sentimental items you love to see every day, and so on. Upon completion, scheduling a time to sit together and compare is essential to guarantee your home will be a place where both of you are comfortable and at ease. By discussing each person’s idea of “home,” you are providing each other with the ability to compromise before the move even happens. This not only shows that you both respect one another’s needs but also expresses that each of you understands how important including each other in decisions regarding your household is. Talking through all the details will help each of you to ease into living together since you will have a solid understanding of what the other person’s needs might be, and how you might need to alter your actions to ensure you have harmony. Compromise and communication are the building blocks of a healthy relationship, as well as the best way to work through combining homes. If you’re moving into a new home, walking through the house as a couple and discussing which items will go where helps smooth the transition from living alone to living with a partner. Not only is it super fun activity, but it gives both of you the opportunity to make sure your home is a perfect balance of the two of you. If you’re moving from your home into your partner’s or vice versa, this step is even more critical. Chances are you’ve spent ample time at his or her place, but, now that you’re moving in, going through and looking at everything will help you both determine places where you can fit your belongings. Sometimes this is one of the areas where couples have some friction but do your best to exhibit patience. If things get a bit tense, don’t be afraid of reminding each other you’re making a home for the both of you. Admit it; there is no better feeling than going through your home and closet and seeing boxes of unused items being taken away. It instantly makes you feel accomplished and like you could conquer the world. 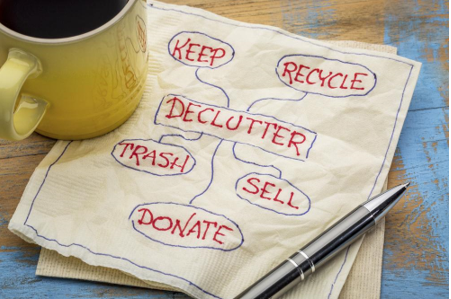 Not only is decluttering the perfect way to start a new chapter in your life, it means less stuff to move. When clearing out old items, this might also be a great time to discuss furniture. Do you really need four couches? Maybe, but most likely not. Spend some time lying, flopping and lounging on each other’s sofas and chairs and then decide together which ones you would prefer to keep. If neither of you is in love with or attached to your furniture, this is also a wonderful opportunity to donate all your old furniture and go shopping for new items that you can pick out together. Now that you know where you’re moving, and you both have pared down your personal items, it’s time to get cracking on the move itself. Moves, in general, are stressful and tend to put people on edge, and, when you’re beginning a new chapter together, you don’t want to start it off on the wrong foot. Hiring a professional moving service will cut down on any stress, while also helping to maximize the time you can have to settle in together. Not only can the movers pack up all your items and transfer them to the new place, but they can also unpack for you, therefore allowing maximum serenity during the physical act of moving. Once the boxes are moved over, unpacking items and placing them together is a perfect way to show your significant other how excited you are to share your home. Plus, by unpacking together, you can determine which items should go in which space, preventing any hurt feelings later. The most important thing to remember when moving in together is to communicate. Letting your partner know you are excited to share your space and making each other feel supported and welcomed is the key when combining households. Little things like adding both of your names to the mailbox or planning a housewarming party once you are both settled are excellent ways to let the world know your two homes are now one. Living with your partner is amazing. Enjoying inside jokes, snuggling up next to him or her on a bad day, and knowing at the end of the day you have someone who loves and supports you are priceless. 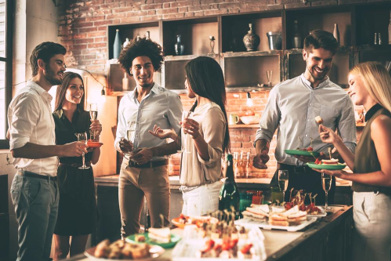 While there will be bumps in the road and likely some growing pains as you both adjust to having someone else to consider when hosting guests or family, ultimately seeing that person every morning and every night makes it all worthwhile.